The Linda Matney Gallery’s Lineage features artists Caroline Absher, Jennifer Meridian, Asif Hoque, Nicole Mouriño, Andrew Shears, and Sophia Zu’bi. The artists range from emerging to established, and the themes vary. Though diverse in style and subjects, the artists share a common link to Pratt Institute and New York City. All were educated at Pratt with the exception of Meridian, who was born and raised in the city. Several threads connect the artists of Lineage. The artists consider the title’s many meanings, exploring it personally, politically, and thematically. The lineage of art history appears primarily through the influence of expressionism and Western modernism, though other traditions appear, such as the evocation of ancient art or the continuation of realist tendencies. Perhaps most significantly, the figure—especially the abstracted form—ties the works of Lineage together. Caroline Absher uses precise contour line to create emotive portraits in stylized environments, often considering femininity in the figurative tradition. Asif Hoque and Sophia Zu’bi distill the body into reductive form and bold color so as to suggest archetypes and emotional states. Hoque is an immigrant and Zu’bi is a first-generation citizen. Their consideration of lineage incorporates the effects— emotional and otherwise—of migration, culture, and place. Immigration and its concerns shape the work of Jennifer Meridian, too. She employs vibrant surface patterns and sculptural techniques in her distorted portrait a woman and her children. Considering related notions of cultural displacement and adaptation, Mouriño represents the figure through images of images, such as a figure on a poster or other piece of ephemera as it appears in bodega windows in New York City. Finally, Andrew Shears’ contemplative figure studies offer up an introspective counterpoint to the bright colors and suggest the lineage of realism in American art. exhibited work at the Linda Matney Gallery since 2014. Happiness and peace inspire Zu’bi, and her work suggests a largely optimistic worldview. She eschews faithful reproductions of reality, instead focusing on emotional states. For Zu’bi, art is a vehicle to translate feelings. Indeed, her work often comes from personal mediations. Reading and writing, especially poetry and journals, play an important part in Zu’bi’s practice. in a room in which the floor, curtains, windows, and tabletops collapse into flat, graphic pattern. It suggests the distilled and jubilant interiors of Henri Matisse. Also evoking the French modernist’s reduced palette and bold contour lines, When the World Split in Half (2018) shows a man and woman painted in bright yellow and pink. They stand on opposite sides of a fiery chasm and reach out to one another with exaggerated, long arms. Works like Guitar Boy (2018), which shows a musician in fragmented planes of color, reveals the influence of Pablo Picasso’s synthetic cubism and suggest a more analytic strain with Zu’bi’s body of work. Painter Caroline Absher lives and works in Brooklyn. As a student at Pratt Institute, Absher studied both fine art and art history. She began exhibiting work professionally in 2014. As well as working as fine artist, Absher is an art director and production designer for television. rendered eye or the sharp edge of a garment contrast gestural accumulations of color. The effect is a controlled, formal tension that creates a focal point of graphic clarity. Perhaps the most emotionally charged painting by Absher in Lineage, is her Self Portrait (2017). It shows the artists reclining on her stomach, her faced tilted toward the viewer as if in contemplation. The painted passages around her—scraped, scumbled, and splattered on the canvas’ surface— captures the viscosity of her medium, oil paint. The intensity of the environment suggests intense emotion and thought. Such strategies recall the work of Austrian Expressionist Oskar Kokoschka (1886-1980), whose portraits and self portraits relied on frenetic applications paint and color. Based in Pittsburgh, Jennifer Meridian (b. New York, New York, 1979) creates art through a queer feminist lens. Her practice includes drawing, sculpture, video, performance, and photography. Meridian addresses diverse topics such as contemporary politics, representations of women in popular culture and art history, and gun violence. Meridian’s work has been reviewed in many prestigious publications, including The Guardian, The Wall Street Journal and Time Magazine. Running Mother with the Twins (2018), Meridian’s contribution to Lineage, is a 13-part wall sculpture that merges two- and three-dimensional conventions. Each component features a different surface design and represents a fragmented part of the body of a woman and her children. Oriented diagonally, the figure seems to alight on her back foot. The subject of mother and child has a long place in art history. Indeed, Meridian is interested in the role of the maternal body’s place in art history, tracing its significance to the Paleolithic Woman of Willendorf, a small figurine discovered in modern- day Austria in 1908 that was created about 25,000 years ago. Among the oldest representation of the human form, the emphasis on her primary and secondary sexual attributes and seemingly gravid stomach suggest notions of fertility and reproduction. Though steeped in art history, Meridian’s impetus to create Running Mother with the Twins comes from the present-day subjugation of women—particularly the oppression of black and brown women. The artist’s chosen medium seems significant. Meridan’s uses Mexican clay, an imported material whose presence here suggests dislocation and a narrative migration. Indeed, Meridian’s wall sculpture invokes contemporary debates surrounding immigration and migration in the United States. Though made prior to the public debate regarding the separation of parents and children by U.S. Immigration and Customs Enforcement (ICE) at the United States border, the sculpture’s subject of a fleeing mother and her offspring suggests the tragic plight of refugee parents and children, many of whom were separated. For Meridian, however, the subject began on a local scale, inspired by the plight of women, especially economically oppressed women of color, in Pittsburgh. Nicole Mouriño (b. Miami, Florida, 1987) lives and works in Bushwick, Brooklyn, where she shares a studio with her husband, artist Ryan Till. She holds a BFA from Pratt Institute and an MFA from Queens College. She was Artist in Residence at the Queens Museum in 2015 and 2016 and was a Resident with Delali Ayivor at the National Young Arts Foundation in 2016. Her work has been shown at Pulse Miami, Marc Straus Annex, and the Queens Museum. appear below. Referring to the titular “sirena,” the Spanish word for mermaid, a painted image of a mermaid appears on the window’s glass. Other signage reads “HALAL” to indicate food made according to Muslim law. “Habibi” is an Arabic term of endearment typically used to refer to men. The painting expresses a culture of linguistic and culinary pastiche. For Mouriño, New York transcends delimiting, binary notions of race that reduce Americans to simply black or white. Her paintings suggest the more diverse racial makeup of Latinx identity, and the bodega functions as an optimistic and inclusive space of potential and expression. Throughout his life artist Asif Hoque (b. Rome, Italy, 1991) has adapted to and absorbed new cultures. Born in Rome to Bangladeshi parents, Hoque grew up in South Florida. As a student, he moved to New York to attend Pratt Institute. He possesses a multicultural identity formed by constant engagement with the world around him. As such, Hoque is mindful of how other perceive him and how he should adapt and connect accordingly. He hopes that this enables him to make connections with his viewers through his art. combined with his distortion of the figure and gestural sensibility, evokes abstract expressionists forebearers, especially American painter Willem de Kooning, whose abstract expressionist canvases relied heavily on the human form. Hoque’s abstractions from 2016 suggest in- definition; the body in amorphous and fragmented form, sometimes suggesting sensual embrace. Following this series in 2017, Ho que continued to work with a broken style in his drawings. Yet, his palette became more vibrant, anticipating his recent, boldly colorful paintings that feature more representational, often whole- bodied subjects. Shown in tropical environments, Hoque’s recent series of figures are active, as if resisting stasis. For example, Just Like Baba shows a barefoot man dressed in a denim jacket and striped pants. His face is cropped out of the frame, making him an everyman rather than a specific individual. He leaps, poised midair against a yellow sky and flanked by curving palm trees as if to suggest a state of liminal bliss. Other, untitled paintings show figures surrounded by lush vegetation. The most abstract of this recent body of work, an untitled painting from 2017 suggests dance through a mass of figures juxtaposed against colorful, leafy patterns and checkerboard floor. The effect is celebratory, as if to express the potential inherent to change and transition. Brooklyn-based artist Andrew Shears (b. 1990, Boulder, Colorado) studied journalism at the University of Colorado before turning to art. His decision came, in part, from a transformative experience visiting artist Dalva Duarte in southern France. Shears returned home, dropped out of school, and moved to New York. He built a portfolio and applied to Pratt Institute, where he was exposed to critical theory and a rich art history of particular to the city. Shears’ realist sensibility reveal a solid, classical training. 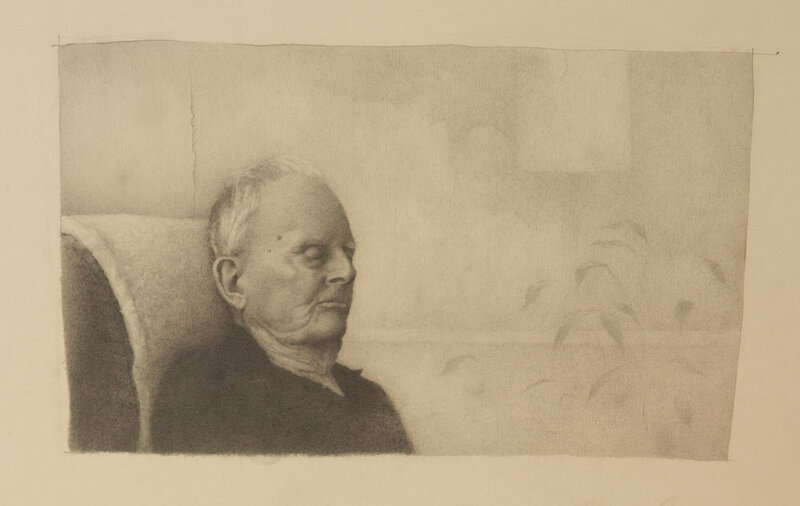 His drawings and paintings harken back to nineteenth-century academic and realist styles in Europe and America. Though marginalized by modernist abstraction, these styles persisted in Western art. Shears is influenced by Spanish realist painter Antonio López García (b. 1936) and American realist painter Andrew Wyeth (1917-2009). Both paint careful representations of everyday life in muted, naturalistic color. Following suit in his work for Lineage, Shears paints subtle details with a practiced hand. Through observation, he draws out tiny details in the mundane, such as the myriad modulation in a plain white wall or a stack of folded linens. Shears’ representational figurative drawings come from a long education and practice that he developed during a year of regular sessions at New York’s Grand Central Atelier. Shears’ keen observation and developed style comes in part from his skepticism regarding the role that technology plays in contemporary life. While Shears eschews this as a literal subject in his work, it nevertheless influences his subjects, themes, and style. To be sure, his work is shaped by his careful attention to the small details of lived experience. The effect is a realist style and meditative approach.